Affiliate marketing. For any business that thinks the price tag of marketing campaigns and the services of agencies are way too expensive, affiliate marketing is the cost-effective tool to grab for in order to keep growing business. Affiliates can be your champions, talking up your business and helping to win you new clients – while not on your clock or payroll! This makes referrals valuable enough. Then, when you factor in how much more likely people are to trust recommendations from a known source, affiliate marketing becomes a tool that no one should overlook. With OSI Affiliate Software, or Omnistar Affiliate, it’s especially easy to set up and manage an affiliate marketing program. Omnistar Affiliate is referral software that seamlessly integrates with your website, allowing customers to refer you to friends and family members with barely any effort on anyone’s part. Once you’ve signed up, new customers can automatically become affiliates, driving traffic and sales. What’s more, Omnistar Affiliate helps to track all affiliate activity, so it’s easier to reward “partners” with either payments or prizes. You can also set up contests among your affiliates to supercharge their referral efforts. Wherever you appear online, OSI Affiliate Software goes with you. This heightened presence means that when people purchase your goods and services from the likes of Amazon, Shopify, MailChimp, and PayPal, they will also have the opportunity to spread the word immediately, at the point of sale – increasing the odds that they’ll do so and ensuring that you don’t let any great potential leads slip by unnoticed. Omnistar Affiliate enables businesses to take advantage of referral marketing for both websites and offline stores. Simple social share widgets, feedback surveys, contest management, customizable coupons (and a growing list of other features) are designed for letting customers promote you quickly and widely. If you’ve been curious about marketing but have worried about being priced out of the game, then you probably know something about search engine optimization, social media, sign-ups, discounts, etc. 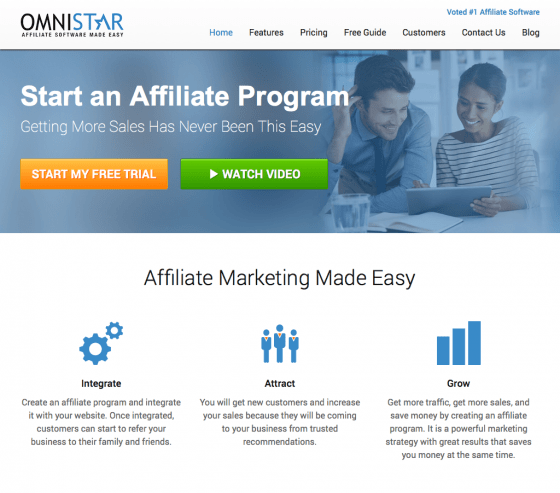 With Omnistar Affiliate, all of these facets of running an effective affiliate marketing program are part of the package. Sharing real-time statistics with your referral partners helps them better realize the benefits of continuing to support your business – just one more way that Omnistar Affiliate further motivates your customers to give their referral. Learn more about how you can keep your money in your pocket and still grow sales at osiaffiliate.com. Plans begin at $47.95 per month, and start with a 15-day free trial period.